This is a Disabled Accessible Luxury villa with a bedroom and bathroom adapted to accommodate disabled guests. Welcome to this luxury south facing villa, which over looks the beautiful lake and fountain at Hampton Lakes. This privately owned villa is situated just 15 minutes away from World Drive. The entrance to all the delights that Disney has to offer. The Magic Kingdom, MGM Studios, Epcot Centre, Typhoon Lagoon, Pleasure Island, Disney Village and Animal Kingdom. Sea World, Universal Studios, Islands of Adventure, Discovery Cove, Splendid China are all within easy reach of this villa. This 5 bedroom/4 bathroom villa comfortably accommodates up to twelve guests and is located in the beautiful surroundings of 'Hampton Lakes' two miles south of the US192. It is ideally situated to enjoy all that Florida has to offer. There are golf courses, shopping malls and numerous restaurants all within easy reach of this superb villa. Interstate 4 provides easy access to either the Gulf Coast and it's stunning beaches, or the East Coast where you can visit the Kennedy Space Centre, Coco Beach or enjoy the surf and numerous water sports. 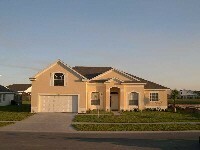 The villa is fully registered and licensed with the Florida State Tourist Authority. Our local representatives ensure that the property is cleaned and maintained to the highest standards, and are always on hand to ensure you enjoy a trouble free holiday of a lifetime. We only accept family groups and this is a no smoking villa. The Communal facilities on site at Hampton Lakes include tennis courts, volleyball and basketball court and a large swimming pool. For younger members of the group there is a well-equipped children's area.